Apparently this looks as if it is going to turn into a bit of a rant about open source, the title of this entry is a quote from the movie Anti-Trust with Ryan Phillippe, mainly to illustrate the necessity and importance of open-source. This may seem like an obvious statement to make but through collections of open-source tools it is possible and often even practical to write and distribute software for commercial purposes. The difficulty I have more recently found is with maintenance. I use many open-source tools for various projects (e.g linux, buildroot, yocto, open-rave) for development of robot systems, embedded controllers etc and use of up-to-date tools is often so simple almost to defy belief, plug-and-play! However, older tools, or in fact tools developed specifically for hardware that is now out-dated can be much more complicated. An example from recent experience is that of utilising embedded Linux to create a simple Network Attached Storage (NAS) device, with low power and running from spare SATA drives that I had laying around. 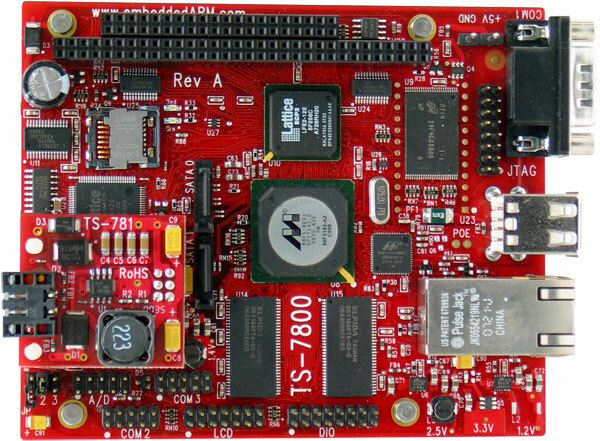 I was able to get hold of a Technologic systems TS-7800 single board computer with which to base this project as it boasts a semi-decent 500MHz ARM9 CPU with 128MB of DDR-RAM a Gigabit Ethernet port 6 serial ports (for interfacing with external hardware), 110 GPIO pins and 2 SD card slows. The really impressive thing this board had, in comparison to other single board computers, were the two SATA ports which would provide superior performance over using USB enclosures and access the data that way. The long and short of it is I haven’t yet got the TS7800 doing anything useful! A lack of documentation (maybe patience…) has yielded little results. I was guided to the open source building of Linux distributions, Yocto and Buildroot. For the versions that exist there are different specific commits with different combinations of different packages, cross-compilation tools and irritating options that seemed to be an absolute mine-field… but I was not deterred!! I persevered attempting to build a workable system with this unit but every tutorial or walk-through I found was woefully out of date and failed to build. So if ANYONE has had any experience with these projects or this SBC let me know!